Conservative Party embarrassed by latest poster? The Conservative Party have released a new poster that is plastered across marginal constituencies. It features Alex Salmond, former leader of the the SNP, pinching some cash from the back pocket of an unsuspecting man. The poster substantiates the headline claim and image by implying that the SNP would want more borrowing, higher taxes and increased welfare handouts in order to join a coalition government with Labour. What is slightly strange about this poster launch is that the Conservative Party haven’t mentioned it once on their Twitter feed or Facebook Page. Usually the Conservatives heavily promote their new posters on their social channels, so there is obviously some reason why this poster is being hushed up (despite the fact that I’ve driven by 3 sites carrying the poster in the 3 days since it launched…). The only version of it I could find online were photos people had taken and posted on social media. It’s certainly not one of the Conservative’s better posters. The line of attack just doesn’t seem tenable. Crucial to the success of an attack ad is believability; if the viewer hasn’t already had a nagging suspicion about the topic it will likely fall flat. The ‘Miliband in Salmond’s pocket’ execution was so powerful because it was primarily about leadership. It was an attack on the ability of Miliband to take control of a government – an idea that almost everyone would have played with in their mind at some point. This execution, with its focus on the details of a fictional coalition deal, is wide of the mark. It also seems like the public are beginning to tire of the SNP / Labour line of Tory attack. 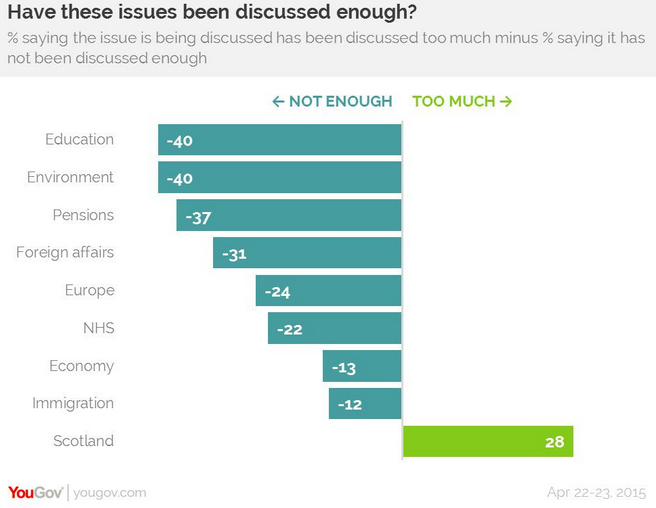 The graph below from YouGov should give the Conservatives the nudge they need to return to their original strategy of focusing on the economy and leadership. I was surprised to see a smaller version of this in a seat I was campaigning in over the weekend. Surprised because in print on a billboard the smaller version works really badly, with tiny print at the bottom which is hard to catch even when passing slowly on foot let alone if you’re in a vehicle on the busy main road it was next to.